Ford Motor Co. said it made $2.7 billion in 2009, its first full-year profit since 2005. The automaker also said it will remain profitable in 2010, putting it well ahead of its stated goal of restoring profitability by 2011. 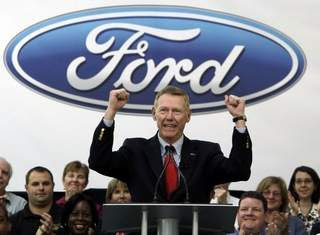 "While we still face significant business environment challenges ahead, 2009 was a pivotal year for Ford and the strongest proof yet that our 'One Ford' plan is working and that we are forging a path toward profitable growth by working together as one team, leveraging our global scale," said CEO Alan Mulally. "In every part of the world, we are providing customers with great products, building a stronger business and contributing to a better world. Our progress has helped us gain market share in most of our major markets." Ford's profit was a sharp contrast to the record $14.6 billion loss the company reported a year ago. Before taxes and excluding special items, the automaker's operating profit was $454 million. And Ford plans to share its success with workers. Under a profit-sharing agreement with the United Auto Workers, it will pay each of its 43,000 eligible U.S. hourly workers approximately $450. U.S. salaried workers will not be getting bonuses, but the automaker previously announced it was restoring merit pay increases and 401(k) matches that had been suspended. The Dearborn-based company also reported fourth-quarter earnings of $868 million. Excluding special charges and taxes, Ford's fourth-quarter operating profit totaled $1.8 billion, or 43 cents per share. It was Ford's third consecutive quarterly profit, and significantly better than the 26 cents per share Wall Street had expected, according to a survey of 13 analysts by Thomson Reuters. "We believe Ford has the liquidity and clean balance sheet to make it to 2011, when it should consistently generate cash due to working capital inflows, higher production and structural and legacy savings," said analyst Eric Selle of JPMorgan prior to today's announcement. "Our enthusiasm is tempered by a lukewarm 2010 outlook due to higher advertising expenses, capital expenditures, raw material costs and interest expenses, as well as a tepid European forecast." For the fourth quarter, Ford's North American operations reported a pre-tax operating profit of $707 million, compared with a loss of $1.9 billion a year ago. The company attributed the gains to higher sales volumes, net pricing increases and lower materials costs. In South America, the company reported a profit of $369 million, up from $105 million in the last three months of 2008. Europe posted a profit of $305 million, compared with a loss of $338 million a year ago. In Asia, the Pacific and Africa, Ford eked out a $19 million profit, compared with a loss of $208 million for the same period a year ago. Ford's Swedish brand, Volvo, narrowed its loss to $32 million from $736 million a year ago. Ford is currently negotiating a sale of Volvo to a Chinese automaker. The automaker's lending arm, Ford Credit, reported a pre-tax operating profit of $696 million, compared with a loss of $372 million a year ago. The company said the increase reflected lower residual losses due to higher auction values and lower provisions for credit losses. Today's strong financial results are more good news for a company that has been riding high since sweeping the "Car of the Year" and "Truck of the Year" awards at the North American International Auto Show in Detroit earlier this month. Ford, which is four years into a painful restructuring that has seen it eliminate tens of thousands of jobs and close 14 factories, was the only U.S. automaker not to seek a federal bailout. It also was the only one to avoid bankruptcy. Ford reduced its automotive structural costs by another $500 million in the fourth quarter. That brought its 2009 cost reduction total to $5.1 billion -- well ahead of its full-year target of $4 billion. The company said these improvements reflected lower manufacturing and engineering costs, a reduction in pension and retiree health care expenses, and lower advertising and sales costs. Ford ended the year with $25.5 billion in cash reserves, nearly double the $13.4 billion it had at the beginning of 2009. While Ford said it will remain profitable in 2010, the company cautioned that its costs will increase as it ramps up production to meet an expected increase in the demand for its cars and trucks. It said this year's cash flow will be less than it reported in the second half of 2009. "We delivered very encouraging results in the fourth quarter and for full year 2009 despite severe economic headwinds, although our transformation remains a work in progress," said Lewis Booth, Ford's chief financial officer. "We are committed to staying absolutely focused on executing our plan to deliver profitable growth." I am hoping Ford dips to nine dollars a share so I can get a better deal with my tax refund $$$. We all know it could very well be at 30 or 40 dollars a share in a year or two, EcoBoost hasn't fully hit the scene yet, neither have their all new V8s. You thought mustangs and f150s sold like hotcakes before, these new V8s are the Bees Knees!